If you’re in the US, it’s pretty hard to miss that Christmas is around the corner–oh, and businesses everywhere would really like it if you would shop ’til you drop. I enjoy celebrating Christmas, and I’m all for supporting businesses that share my values, especially local, vegan ones. But I cringe at the amount of waste that often comes with all that shopping, and sometimes it’s hard to find the right match of a gift both you and the recipient will feel good about. Here are some ideas to help you over that hurdle, and help humans and animals alike have a great holiday. They’re tried and true for a reason: food gifts can work for just about anyone, and it’s particularly rewarding to introduce people skeptical of vegan diets to delicious chocolates or other goodies. Recent finds at the Violet Sweet Shoppe’s new, all-vegan candy store in Seattle. The hazelnut-truffle log is To Die For. You can buy fancy vegan treats at Violet Sweet Shoppe, Vegan Haven, Food Fight or an online store like Vegan Essentials. If you’re handy in the kitchen, you can save money and packaging *and* impress your friends, family and coworkers with homemade cookies, bread, preserves, or whatever suits your skills and tastes. Need inspiration? Vegan Cuts not only sells foody things you might want to give, but they posted a great little list of recipes-in-jars you can make yourself. Pinterest is absolutely full of any combination of vegan/crafty/food/gift ideas you can imagine. 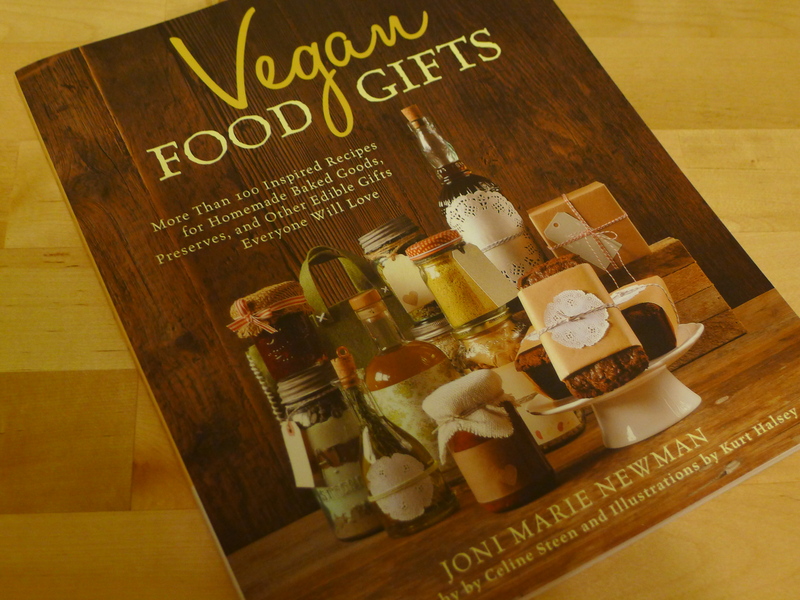 The book Vegan Food Gifts, which I received myself as a present last year, also has lots of great options. This book includes both recipes and tips and patterns for nicely presenting the finished products. Remember that not all food gifts need to be sweet–with all the desserts weighing down tables this time of year, quick makings of a hearty stew or spiced nuts can be welcome alternatives. If your local farmer’s market is still running, be sure to check the stalls for ideas! You might find locally made wines, beautiful heirloom beans (that could join your favorite soup recipe as a lovely gift for a cook), nuts, jams, pickles, and lots of other items that will make both the recipient and a local farm family very happy. Do your friends and family like to drink? Wine, craft beers and spirits all can make thoughtful gifts, and with handy resources like Barnivore, choosing vegan options is easy. If you’re shopping at a small winery, brewery or distillery that’s not yet listed on Barnivore, you can ask the proprietors directly about their processing, and support a small business while you’re at it. Don’t forget “experience” gifts! If there’s a museum, park, activity, artist or other interest dear to your gift recipient, think about tickets or gift certificates to add some more of those favorite things to the lives of your loved ones. For spending quality time with a special someone, did you know that both Portland and Whidbey Island, WA have entirely vegan B&Bs? Last but certainly not least, don’t forget about the extra-generous gift of donating to a charity on someone’s behalf. Invest a bit of time to think of a charity that represents values both you and the recipient share, and make a contribution of any size in the person’s name. Some organizations will notify the honoree directly upon request; otherwise, you can share the good news in a nice card. Vegan Outreach is a wonderful organization that reaches millions of people each year with information on why and how to go vegan, and they happen to have a fund-match in effect through the end of this year, so your gift will go twice as far. Other fantastic options are your local animal sanctuary or shelter, or a food bank, like Northwest Harvest, which will readily earmark your donation specifically for fresh produce upon request. However you celebrate the winter holidays, if gift-giving is on your list I hope this helps with some ideas. I’d also love to hear your suggestions for favorite recipes, causes, or traditions, or new things you’re trying this year. **Note: I’m not compensated in any way for these or any other recommendations. These are simply businesses, products and non-profits I like and think you might as well. 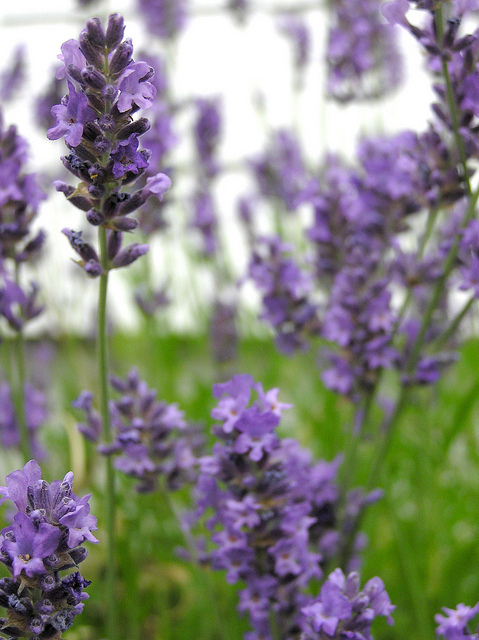 The Northwest loves its lavender, and right now is around the peak of the season. The annual Sequim lavender festival is this weekend if you want to really immerse yourself in all things lavender, but you can also find cut lavender–fresh and dried–at your local farmers market (or just walk around any garden-friendly neighborhood). But what do you do with that lovely lavender once you have it? Until now I’ve stuck with simple sachets for drawers or to throw in the dryer, but this week I’ve made some delicious beverages with lavender syrup. If you get culinary-quality flowers (no pesticides, etc. ), it takes just a few minutes to turn them into fragrant syrup and just a few minutes more to make lovely hot or cold drinks with that. Start with this simple recipe for syrup. I made a half batch, which yielded just about a cup. Combine water, syrup and lemon juice, and stir well. Taste and adjust proportions as you like. This is not as sweet as most lemonade that you buy, and is roughly balanced between lemon and lavender flavor. Serve over ice with garnishes. Serves 2-4, depending on how thirsty you are! Try this also with some or all of the water replaced with chilled sparkling water. This is my variation on a London Fog, named after the Dungeness Spit near those Sequim lavender fields. 2-4 Tbsp. nondairy milk, depending on how “foggy” you want your tea. I recommend coconut, almond, soy, or a blend of any of those. Vanilla-flavored milk would be great in this. Brew the tea a little bit strong, and remove the bag. Stir in the syrup and milk, and enjoy! I’m a newcomer to the whole foods/unprocessed way of eating, and I’m certainly no purist. I became vegan in college because of the animals and the environment, with any health benefits being a distant third. Over time, though I’ve gradually oriented my eating more in a whole foods direction. Again, the motivation is only partly for health, though that matters more and more to me. There are other benefits, too, like not buying junk from companies I don’t like anyway, not harming the environment with the excessive packaging that often goes along with highly processed foods, and sometimes even saving money. When I started blogging and started following many other blogs, I found myself reading a lot from vegans who avoid or minimize processed foods. Initially, I read their posts with a lot of skepticism. Some make health claims that they’re not qualified to, and which are a little too categorical to be true. Some seemed to have different preferences in food than I do, sharing recipes that frankly didn’t look very appealing. Some were clearly spending a lot of money on specialty ingredients, or time on food planning, prep and preservation that I just didn’t have. But gradually, some things started to stick. Looking at Annie Oliverio’s beautifully photographed recipes, reading Gena Hamshaw’s measured, low-key approach to eating a mix of raw and cooked foods–while maintaining a super busy life–and steering strongly away from dogma and goals of “purity,” and a whole slew of other bits I found on Pinterest, Facebook, Twitter and the like…all of those things made a shift toward whole foods seem both appealing and achievable. This is such a great idea. And maybe one month turns into two, turns into three…and then it’s just a way of life. It didn’t go quite like that, but a year and a half later, I really am eating a mostly unprocessed diet, at least at home. I thought I’d share some of my favorite tricks that make this easier, cheaper and resistant to my amazing ability to let food languish and spoil in my refrigerator! Unprocessed food doesn’t have to be complicated to be good. Sure, you can wow your friends and maybe curb some cravings with carefully crafted baked goods or adaptations of pasta dishes that taste good and not like their preconceptions of unprocessed foods. But you’re likely to invest a lot of time–and some expensive failures–in the process. Most of the time, then, I like to keep it simple. Bowls come together quickly with components from your freezer, pantry and anything fresh you have on hand. Cooked quinoa for breakfast? Turns out it’s quick and really tasty! 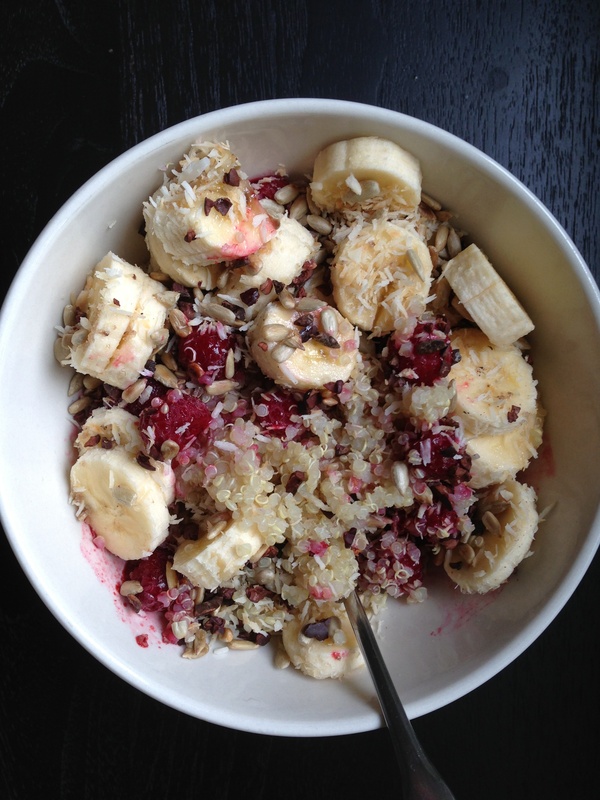 One of my favorite breakfasts is quinoa with fruit (here you see frozen raspberries and fresh banana), cinnamon, vanilla-bean salt and toasted coconut, cacao nibs and sunflower seeds). Eat it cold or warm it up just a bit. For lunch or dinner, I also use a lot of quinoa (or rice, or millet, or wheatberries), with beans, fresh or frozen veggies, sunflower or pumpkin seeds, and some sort of sauce or dressing. Quick, healthy, and endlessly versatile. I also like using raw or cooked greens as a base when I might otherwise use something like pasta or bread. It certainly doesn’t fit every dish, but it often works great. A veggie burger crumbled on a salad is easy and often feels more like a meal to me than just putting it in a bun. The freezer is my friend–if I use it right. Living alone and spending a lot of time/meals at my boyfriend’s house, making big batches of things only saves time if I’m smart about saving portion sizes in the freezer. A quart of soup will never get thawed and eaten, and will take up way too much space until I give up on it. I like pint and half-pint canning jars (especially for soups and stews), small square containers by Frigoverre (perfect for portions of cooked quinoa or rice, or beans, and very space-efficient), zip-top bags (freeze flat with a thin layer of lemon juice, tomato paste, ginger purée, pesto or similar items, and you can just snap off what you need), and little glass spice jars (particularly for citrus zest, which is so useful to have on hand!). Zested lemons, ready to be juiced. Speaking of which, my standard approach to using any kind of citrus: buy organic, wash thoroughly, and use/freeze it soon after you buy it. 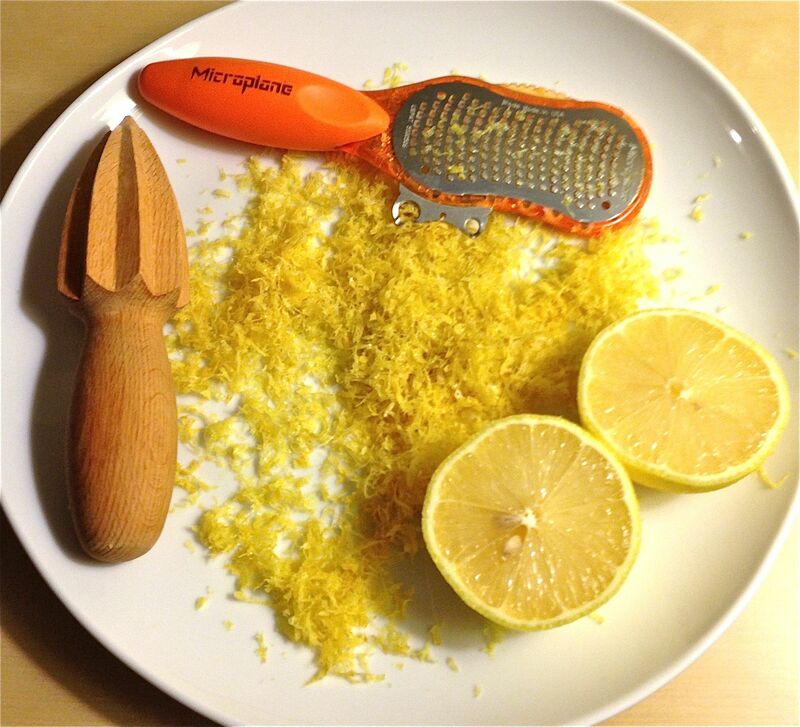 When you use it, zest all of it and freeze the zest. Then juice all of it and freeze whatever juice you don’t use right away. This has cut down dramatically on the sad, shriveled lemons and fuzzy-bottomed limes I used to wind up with far too often, and it’s fantastic to have fresh juice and zest at the ready all the time. Skip that awful bottled stuff! Rice cakes, not bread. Don’t get me wrong–I love bread. But my record of finishing a loaf before it dries out or gets moldy is not. good. If I do buy (or make) a loaf, I slice it right away and freeze whatever I don’t eat that day. The rest of the time, I keep a supply of whole-grain rice cakes on hand. Breakfast in a hurry? PB and apple or banana slices on a rice cake. Afternoon snack? Savory spread on a rice cake, maybe with tomato or cuke slices, or topped with vegan cheese. Recovering from a migraine and not big on food yet? Plain rice cake! Keep them tightly wrapped, and you can come back weeks later to perfectly good, almost-instant bases for snacks and meals. You don’t have to break the bank on nuts. Have you seen the price of nuts lately? Yikes! $16/lb for organic walnuts or pecans is just not something I can do often. They’re delicious and nutritious and useful in all kinds of dishes, but you know what else is, too? Sunflower seeds. Which I can usually get for $3/lb, organic. Raw, I’m not crazy about their flavor but I do use them in savory spreads similar to these from Viana. 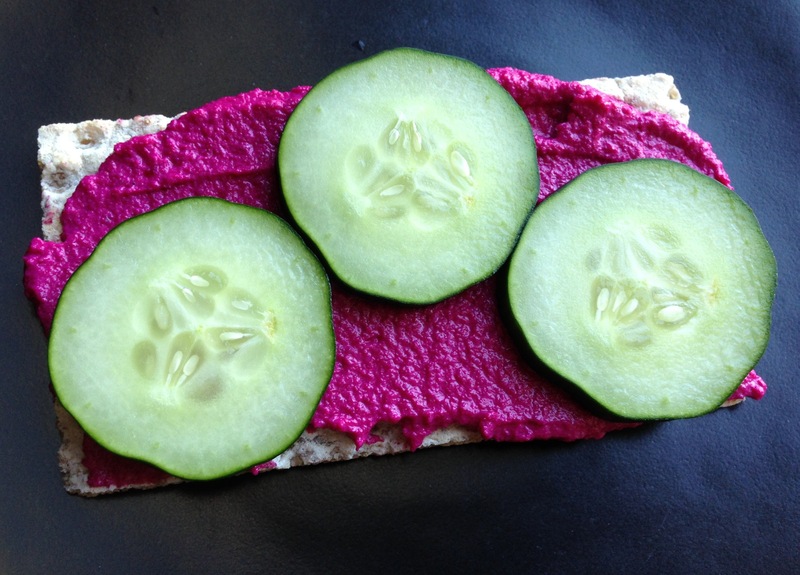 Sunflower-based spread flavored with beets and horseradish, served on a rye cracker with cucumber. Freshly toasted, though, they’re fantastic on salads, with sweet OR savory bowls, made into sunflower seed butter, or just eaten out of hand. They also happen to be really good for you, and are non-allergenic if you are cooking or baking for people with nut allergies or schools with no-nut policies. So sunflower seeds are my default “nut” (with pumpkin seeds often used in similar ways, too), and I save the splurges on actual nuts for where I really want the specific flavor or texture of a hazelnut, almond, etc. What tricks have you uncovered for eating less-processed foods without spending all day in the kitchen? Or is there something you’re stuck on and want to see what others have come up with? Please chime in below! Clearly, blogging has not been a priority for me lately. Part of the reason is that I’m in the midst of making a big change in my life: this spring I left my job at The Seattle Times, and I’m now a full-time student, exploring classes in the areas of web design and programming to see what I want to focus on for my next act. This quarter I’m taking Introduction to Web Design, and our final project is building a website for a client. Do you or someone you know need a simple, straightforward website by June 20? Is “free” the price you’re looking for? Unfortunately, I can’t show you a portfolio of work since this project will be the beginning of that portfolio. This Northwest Herbivore blog just uses a simple WordPress template, so as it is now it’s not a good example of anything but a rough idea of my aesthetics. I’m posting this here and promoting the post in the vegan community because I’d love to use this opportunity to help a fledgling vegan business at no cost. 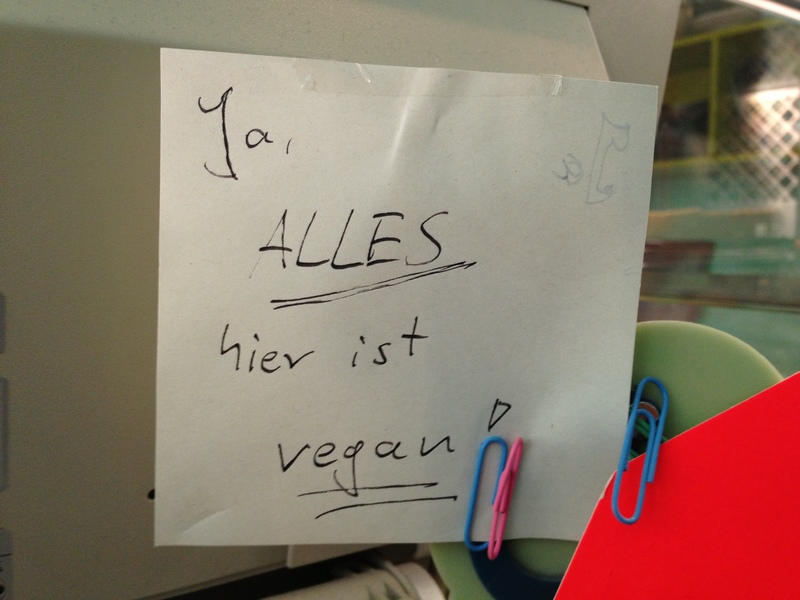 However, the subject matter doesn’t have to be anything vegan related. If you need advanced features like integrated e-commerce or password-protected content, I’m not (yet) your person. My project is due June 20, so you can be confident that you’ll have a functional website by then (but probably not much before). The flip side of that is that I’ll need to rely on you to provide desired features, content and feedback in a timely way so that I can meet my deadlines. This is a learning process for me, and I expect it will be for you, also. If you like the results and want to keep using the site, it’s yours to use. If not, I can either continue to work with you until you have what you want, or leave you to work with a different designer. Please leave a comment here, send me an email or find me on Twitter if you’re interested or have a lead I should check out. No, you didn’t imagine it. I have almost totally neglected this blog for many, many months. There were lots of reasons, but one major reason was a fun one: preparing for and then completing a month-long tour by bike and train of Germany with my boyfriend. Obviously, Germany’s a bit far afield from this blog’s explicitly geographic focus, but I wanted to post about it here anyway for a few reasons. Just a quick post (without so much as even a picture! ), but I wanted to share this tasty soup I made for dinner tonight. It’s easy and fast to make, and the spicy, creamy treatment of the pumpkin made it very welcome during this cold snap we’re having. Heat the oil over medium low in a pot with a wide base, like a Dutch oven. Add the shallots and cook, stirring occasionally, about 10 minutes or until quite soft and just starting to color. Add the curry paste and ginger, and cook two more minutes. Add the pumpkin, broth and coconut milk, and stir well to break up any lumps. Cover and let simmer for 10 minutes. With an immersion blender or conventional blender, puree the soup until smooth. Add the lemon juice and taste to adjust other seasonings. If you use a low-sodium broth you might want to add salt, but it wasn’t needed with what I used. Makes a little over a quart, for two large servings or four small ones. I owe you a wrap-up post for October Unprocessed, but the cooking bug caught up with me tonight, and I decided to go for it and share this recipe with you instead. I’ve never had shellfish soup, and other than a mention that the soup in question was made with tomatoes–and clams and mussels–I really had no idea what I was doing. But a few minutes with Google fixed all of that, and a stop at Whole Foods on my way home had me ready to go. Ready for some fish-o’-the woods soup! Here’s what I came up with, and I’m pleased to report that I’m quite happy with it. It’s kind of exactly what I wanted. I have no idea whether it resembles any traditional shellfish soup, but it’s really good in any case–warming against the cold front that just showed up, full of vegetables and tangy tomato and lemon, and with just a hint of seafood flavor that could be played up for those who don’t share my aversion. The soup is relatively light, so round it out to make a meal. Some blackened tempeh and avocado would be great with this. 1 medium bulb fennel: green tops cut off and set aside; white bulb quartered, cored and thinly sliced. 1 large leek: green tops cut off, washed well and set aside; white part quartered, washed well and thinly sliced. 3 sprigs thyme or 1/4 tsp. whole dried thyme. Lemon thyme would be great if you have it. First, make a “fish” broth based on many of the trimmings from your soup vegetables. If you have a pressure cooker, this won’t slow you down much. If not, you should build in another 30-60 minutes. In a pressure cooker, combine half of the garlic; the ends and leaves trimmed from the celery; half of the tops trimmed from the fennel, coarsely chopped; the leek tops, coarsely chopped; the stems from the oyster mushrooms and about 1/3 of the lobster mushrooms; and 1/4 of the shallots. Add the thyme, whole peppercorns, mustard and dill. Add 1 quart water and seal the pressure cooker. Bring to high pressure; lower the heat and keep at pressure for 10 minutes. Remove from heat and let pressure release naturally. Strain and set aside. Without a pressure cooker, start with a brief sautéing of the vegetables, bring to a boil, and then simmer for 30-60 minutes before straining. While that’s cooking, chop the rest of your vegetables and start them cooking. In a Dutch oven or other soup pot, heat the olive oil over medium-low heat. Add the remaining garlic, celery, fennel, leek, and shallots. Saute 8-10 minutes, or until vegetables are softened but still have some texture. While those vegetables are cooking, on another burner heat a medium skillet over medium heat. Add a bit of olive oil and then the lobster mushrooms, stirring until about half tender. Add the oyster mushrooms and cook, stirring occasionally, until they are softened and reduced in volume by roughly half–about 4-6 minutes. When the vegetables in the Dutch oven are ready, add the fish seasoning, the chili paste (if using) and the Herbamare or salt. Cook for one minute more. Add the white wine and cook for 3-5 minutes, or until liquid is mostly evaporated. Add the cooked mushrooms, the broth and the tomatoes. Cook another 5 minutes, not allowing the soup to get above a simmer. Add the parsley, the lemon juice and several grinds of black pepper. Check for salt and other seasonings and adjust as needed. If you really want it fishy, you’ll probably want to add some dulse, nori, or kelp to the broth or the finished product. Makes about two quarts, which should serve 4-6. Time is flying by, and I wanted to do an update of this unprocessed-foods challenge I’m doing for the month of October. Overall, it’s going well. For the most part, it’s really not that hard, though it’s making me spend significantly more time in the kitchen. To compensate, I’m often eating much more simply than I normally would. Friday night I took leftover roasted broccoli and sweet potato, added some pinto beans and chopped fresh tomato from the CSA, splashed on my new favorite hot sauce (purchased at Sugarpill Apothecary), topped it with chopped avocado, and that was dinner. No multistage cooking; no custom blend of herbs and spices, freshly ground in a mortar; no multiple dishes–just a melange of stuff heated up and thrown in a bowl. And it was good! I do miss having so many options of places to eat out–or variety of dishes I can choose from the menus of vegan restaurants–but thanks to Thrive, Chaco Canyon, Veggie Grill and Whole Foods I haven’t had to rely entirely on my own cooking and could have some very tasty food prepared by others now and then. Jud has (as usual!) been quite supportive and flexible with where we eat, and has even forgone some processed foods in my presence in solidarity. And my awesome friends brought lots of unprocessed food to eat at a potluck brunch I hosted, so there was plenty of variety then. I’ve definitely embraced some routines for the sake of time and simplicity: breakfast is very often a rice cake topped with peanut butter or sunflower seed butter, along with an apple or banana. Could I make a rice cake in my kitchen? Absolutely not. But when the only ingredients are whole grain rice and air, I’d say that counts as unprocessed. Lunches are often brown rice + beans + broccoli + oil/vinegar/spices, if I don’t have leftovers from dinner to heat up. In general, I’m eating far fewer grains because it’s so much less convenient to grab ready-made stuff or make pasta the center of a meal, but since I know grains and grain-like seeds have a lot of valuable nutrients, I’m making a point not to get too skimpy on them. I’m eating a ton of nuts and seeds, and lots of fruits and vegetables. Although I am “allowing” oil in this challenge, I’m being more judicious with it than I normally am, and trying to get my fats from less-processed sources. For example, instead of a standard vinaigrette, I’ve been dressing salads and vegetables with lemon-tahini dressing and sauce. For the first two weeks I actually felt pretty lousy. I had a stomach ache almost all the time. I honestly don’t know how much of that–if any–had to do with the dietary change. I’m sure there was some adjustment to the extra fiber I was consuming, but both generally and in this particular case I’m quite skeptical of things like “detoxing,” so I don’t attribute it to that. It’s also fair to say there has been plenty of stress in my life recently, which frequently manifests itself in the form of stomach upset. So there’s that. A bummer, but it’s better now. Also, it seems I may be more sensitive to soy in certain forms than I’d previously thought, so I’m steering clear of soy milk for now, and when I do eat soy it’s usually as tempeh. I figure that’s one of the least-processed forms of soy anyway. Freshly made almond milk is fantastically delicious. If you’ve only had the stuff in boxes, I highly recommend trying it freshly made. I’ve been working on a couple experimental recipes to use the pulp from my current batch of milk, and I’ll post soon with the results! I also tried making hazelnut milk–and made hot chocolate with it using roasted-and-ground cacao nibs, cinnamon and vanilla. It was a little more textured than I would have liked, but quite tasty nonetheless. I’d also like to try roasting the hazelnuts first rather than using them raw. There are some nice chocolate bars out there that arguably fit the unprocessed guidelines–and some that I really don’t like at all. Stirs the Soul makes a line that is not cheap, but in some cases is quite tasty. I particularly recommend the orange goji-berry (even though I’m not particularly fond of goji berries) and the mint. I was much less impressed with the cayenne-cinnamon and the currant-chai flavors, which seemed not sweet enough (all are lightly sweetened only with whole dates) and with poorly balanced flavors. If I’m going to splurge on expensive, raw chocolate, I want it to really satisfy that chocolate craving. 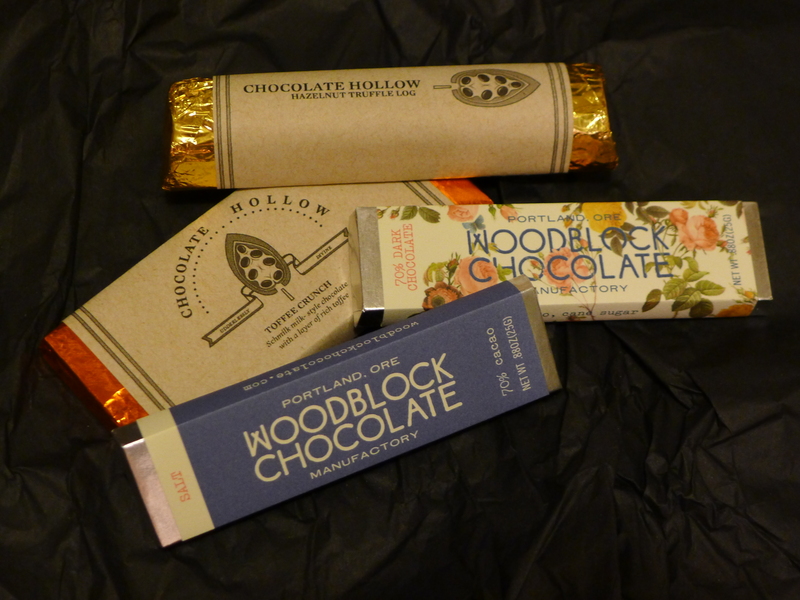 Speaking of expensive chocolate, I picked up one of these at Thrive, and it was very, very tasty. This Hibiscus-Ginger chocolate, on the other hand, I didn’t like at all. I might try other flavors from that line, but the tartness of the hibiscus did not work for me in this bar. I’ve become pretty well hooked on Heidi Ho Veganics Chipotle Cheddar (overlooking the agar, it’s remarkably unprocessed), and today I tried an herb-cashew cheese from Punk Rawk Labs, which was just as delicious as it was expensive ($10 for a 5-oz. tin–ouch!). At the same time I picked up the smoked cashew variety, which I haven’t yet tried. At that price, I can’t see those cheeses becoming a regular item in my fridge, but they sure would be nice for an occasional splurge. Last week I came across a link on Facebook, posted by Seattle Tilth. A blogger named Andrew Wilder was inviting people to join his challenge, October Unprocessed 2012. The idea is very simple: commit to eating only unprocessed foods in October (or at least commit to doing your best toward that goal). I was immediately drawn to the idea. I’ve always liked personal challenges like this and have tried many of them over the years. For me, they’re a way to bump myself out of routine, to question assumptions about how I live and interact with the world, and to learn which pieces of a different approach to living I might want to adopt as longer-term ways of life. October is always a very demanding month for me at work, so I’m going to be a little extra forgiving with myself on exceptions when I really think I need them. But what the heck? I’m going to give it a try. Really, though, I have confidence that despite all the things I’ll be cutting out, in so doing I’ll also be forced to try new things and in many ways expand my food choices and cooking repertoire, just like when I went vegan. Although I won’t be making any effort to restrict gluten, I expect I’ll be eating significantly less of it because I’ll be avoiding many of the things that contain it. I’m hoping to eat more healthfully, to reduce the amount of packaging I buy with prepared-food shortcuts, to eat more locally produced food, and to learn some new tricks. And periodically throughout the month, I’ll blog about it here! With a demanding schedule I won’t promise much in the way of stellar food photography, but I’ll try to include representative photos as I go, plus recipes when I find ones worth recommending. If you have recipes I should try, I’d love to see them! And if you have suggestions for making my pumpkin-crusted tempeh less dry, I’d love to hear about those, too. Almost a year ago, Jud and I headed to Portland for a quick weekend of vegan food tourism with my sister and her boyfriend. We ate and discovered so much it took two posts to report on! This weekend we returned, putting our bikes on the Amtrak Cascades train for a car-free trip that took advantage of this ongoing beautiful weather–and gave us a hand in working off some of the food we shoved into our mouths for another 24-hour whirlwind. Although it might seem odd to have skipped VegFest, which was happening while we were there, it would have been the third such festival Jud and I would have attended in less than a year–and we’re not much on crowds. So we focused instead on enjoying a handful of businesses and the beautiful sunshine! We started with a delicious lunch at Blossoming Lotus. I won’t go into a lot of detail and will just say that this is one of my favorite, most consistently good restaurants anywhere. The menu is a mix of raw and cooked items (all vegan, with several gluten-free options) prepared in fresh, creative combinations. The atmosphere is pleasant and would be very nice for a special date but also works for a casual drop-in while wearing bike-friendly clothing, and the prices are quite reasonable for the quality of food and ambience. There’s a Sunday brunch I’d love to try sometime. Raw falafel wraps. I was alone in thinking they didn’t taste that much like falafel, but we all agreed they were very good. My sister also grabbed a gluten-free brownie to go, which we tried later. Yowza. Super, super good. Fudgy without being stodgy, and plenty of chocolate intensity. There was a bit of time left before the Portland Farmers Market at PSU closed, so we headed over there and made a beeline for Petunia’s Pies and Pastries (Note: the website automatically plays music when you load it–don’t jump!). I’d read about this all-vegan, all-gluten-free bakery business on Facebook and heard my sister’s enthusiastic reviews, but I hadn’t yet tried any of the treats. So many difficult choices! Fortunately, Lisa, the owner, was on hand to help me narrow things down, but it was still a struggle. Those would be s’mores cupcakes, with graham-cracker bases, chocolate cake, marshmallow frosting, chocolate ganache and more cracker crumbs. Tragically, I did not sample. But Maren did and gave full approval. Fluffernutter cupcakes. Seriously. I also summoned the courage to pass on these since I knew they wouldn’t travel well in a pannier. My spoils: Olive-oil orange bundt cake, Almond Joy pie, and a chocolate-covered peanut-butter crispy treat bar. Amazing, every one. I might guess that this was gluten free, but I absolutely wouldn’t care. Definitely up there with the best brownies I’ve had. Petunia’s is scheduled to open a storefront in January, which will make it easier to get a hold of these wonderful treats. I will insist on a stop the next time I’m in town! It was time to take a break from eating for a while, so we hit Powell’s, took a ride on the brand-new Eastside Streetcar and checked out the grand opening of the Oregon Rail Heritage Center. We still weren’t hungry, so we threw in a little more biking and a short walk before settling in for dinner at Canteen, the relatively new storefront run by the owners of the Sip juice cart. Canteen is a small, casual place, with about as much seating outside as in. The inside part smells wonderful from the fresh juices being prepared behind the counter, but we went for the bowls that make up the bulk of their menu. The Portland Bowl, with quinoa, maple tempeh (or sub Soy Curls), delicious yeasty sauce and hazelnuts. I loved the bite I had and would be glad to get my own another time. The Bangkok Bowl: brown rice, adzuki beans, steamed vegetables and kimchi, with peanut sauce. Very good, if maybe a little too similar to the lunch I’d had. Walnut taco salad. OMG. Maren alerted us that someone needed to get this, and she was so right. Next time, this is what I’m ordering. You can see how bright and fresh it is, and the flavors were wonderfully balanced. I wish there were more restaurants that served food like this: nutritious food, simply prepared in delicious combinations. Grain (usually) + legume + vegetables + fabulous sauce. In a reasonable portion and for a reasonable price. Why is this so rare to find in restaurants? If this business were anywhere in Seattle I would be there all the time. Brunch today was at Portobello. For the most part, I love Portobello as much as the next food-lovin’ vegan northwesterner. Maybe because it does so much so well, I found a few nits to pick, but we did have another fantastic meal there. We were pleasantly surprised to beat the line by getting there when they opened (beating a breakfast line is no small feat in Portland, and our last brunch at Portobello involved a little more competition), but for the second time were perplexed at how long it took to get seated with no obvious reason for delays. Once we sat down, the service was just fine, but going two for two on being left to stand around with little acknowledgement was a bit obnoxious. Cashew-cheese-filled “Sweety Pepps,” which were a surprise hit. Jud got the “Vegan Benedict,” which was easily the best version of several I’ve tried. The Hollandaise had a faint almond flavor to it, which was an interesting surprise, and the “housemade smoky seitan ham” was outstanding. Brian got the blueberry waffle. I overload quickly on sweet dishes at breakfast and therefore don’t tend to order them, but the bite I had was delicious. I ordered the “Wild Cascadia” omelet, which I liked but don’t know that I’d order again. In hindsight, I’m not sure they included the cashew cheese sauce it was supposed to come with, which could have made a difference. The chanterelles and slightly cooked heirloom tomatoes were a nice reflection of the shifting seasons, though. Maren got the current incarnation of the savory waffle. The one I ordered last time, I declared–and still believe to be–one of the best dishes I’ve ever had, period. I only tried one bite of this one, so I can’t say whether it still reached that high, but it was excellent, and I’d urge you to try it if you you find it on the brunch menu. It’s gluten free, to boot! Mushroom homefries, with lots of parsley pesto, were another big hit with all of us. After twice trying both the mimosa and the bloody Mary on their menu, I’d encourage you to stick with the mimosa. It’s very well done, and has some nuances of flavor that don’t show up in most mimosas. The bloody Marys, somewhat surprisingly, are the opposite: the one last year was made with tasty, raw, heirloom tomato juice and came with a pickled green bean and wedge of lemon, though its spicing was really underwhelming, and some more fresh or pickled vegetables would have been welcome. Today’s drink, with standard, heat-processed tomato juice, was oddly ordinary and bland, and came with no “salad” at all–just a lone slice of lime. Given the skill and attention to detail evidenced in the rest of their menu, I’m not sure why this one drink seems to slip through the cracks, but it certainly needn’t get in the way of a great meal. This cookie had some of the unfortunate crumbliness that’s hard to avoid in gluten-free baking, but it was very tasty and among the best gluten-free cookies I’ve tried. For those who love Skydottir cookies in Seattle, you should definitely look for these when in Portland. All in all, another fantastic trip! The bike-train combo worked pretty much exactly as planned (be sure to reserve a bike spot well in advance if you do this, since there are only six spots available per train), and we got home to Seattle in time for dinner. Next time I hope to plan far enough in advance to get dinner reservations at Natural Selection or Portobello, which have now twice eluded me in each place. For those of you who went to VegFest, what did I miss?